A series of allegations published by German magazine Der Spiegel in recent days claim City attempted to bypass UEFA's Financial Fair Play (FFP) regulations, but the English champions showed no signs of distraction as they swatted the Ukrainian aside and took control of Group F.
David Silva had already prodded City into a 13th minute lead before they were awarded a comical penalty when Raheem Sterling tripped himself up as he bore down on goal under no challenge from a Shakhtar player. Hungarian referee Viktor Kassai remarkably pointed to the spot and Jesus stroked home the penalty. Jesus scored a second penalty after the break and completed his hat-trick with a lovely chipped finish in stoppage time following further goals from Sterling and Riyad Mahrez. The latest of those to Lyon in front of plenty of empty seats at the Etihad on matchday one two months ago has now been long forgotten as back-to-back victories over Shakhtar and Hoffenheim have put City in a commanding position at the top of the group. Despite the billions invested by the club's Abu-Dhabi owners, City have still to make it beyond the semi-finals of this competition. The fans were in better voice with fewer jeers than usual for the Champions League anthem and City soon clicked into the form that has seen them win 10 and draw one of their 11 games since the Lyon defeat. Mahrez twisted and turned down the right and his low cross left Silva with the simplest of tasks to tap into an empty net. City didn't need any extra help, but they soon got it when Sterling stumbled inside the area. Guardiola apologised to Jesus for nominating Mahrez as the penalty taker when the Algerian missed from the spot late on in a 0-0 draw at Liverpool last month. The Brazilian started up front ahead of Sergio Aguero with one eye on keeping the Argentine fresh for Sunday's Manchester derby. But Jesus may now have played himself into contention by more than doubling his tally for the season. Sterling has been in sensational form in recent weeks and curled home his seventh of the season from the edge of the area three minutes into the second-half. Mahrez made it five by sneaking a shot in at the near post on his weaker right foot before Jesus' chip rounded off the scoring. 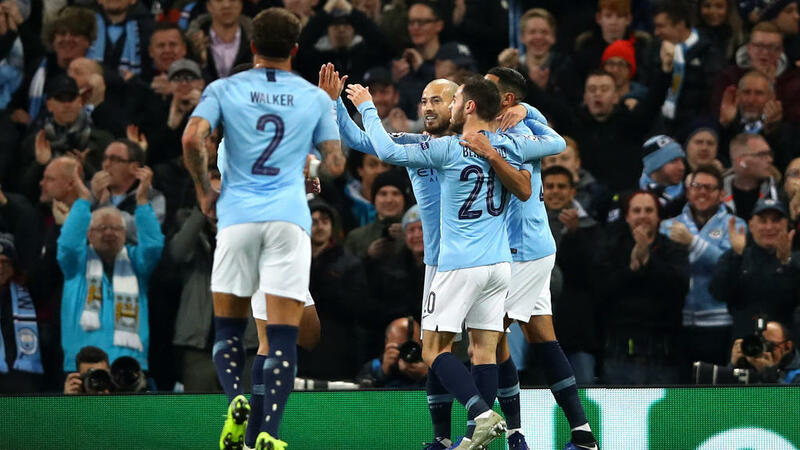 Guardiola also had the luxury of being able to take off Kyle Walker, Fernandinho and Silva early ahead of Manchester United's visit as City look to go 12 points ahead of their local rivals after just 12 games of the Premier League season. Whatever storm clouds may be brewing in City's boardroom, it appears they can do no wrong on the field.